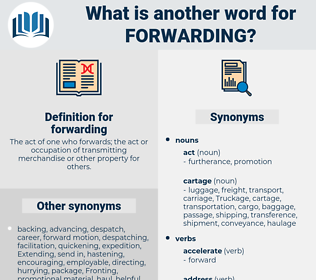 What is another word for forwarding? The act of one who forwards; the act or occupation of transmitting merchandise or other property for others. 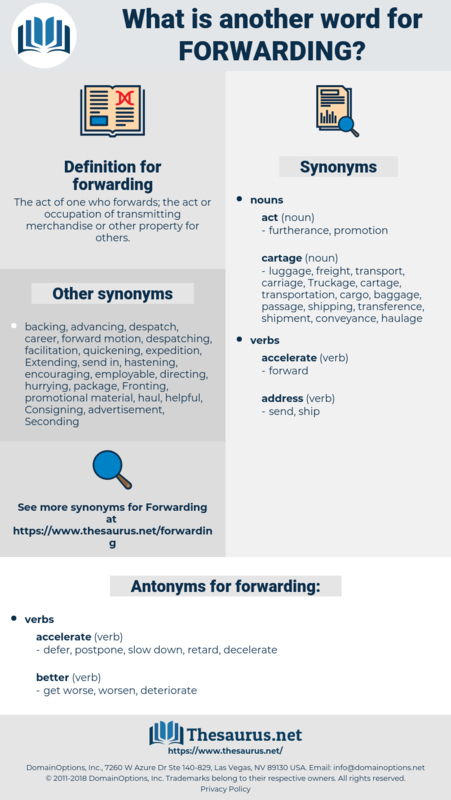 Forwarder, Transhipment, conveying, transshipment, Channelling, trans-shipment, Transporting, Routing, broadcasting, shipping, cargo, issuance, conveyance, loading, Transferring, transaxle, imparting, retransmission. dropped, relayed, mailed, conveyed, Passed. informing, Presenting, Seconding, disseminating, Introducing, Delivering, posting, resending, Deploying, circulating, flowing, re-sending, despatching, Distributing, disclosing, feeding, Referring, directing, projecting, Expressing, Notifying, acquiring, Inculcating, spreading, Achieving, Carrying, Realizing, contacting, assigning, diverting, Furnishing, intervening, Infecting, enclosing, reaching, Attaching, arriving, releasing, Attaining, supplying, Remitting, planting, telling, giving, instilling, striking, calling, making, getting, conveying, Channelling, passing, Transporting, Routing, broadcasting, shipping, Transferring, transmission, imparting. Disseminated, contracted, accompanied, Communicated, infected, Passed. articulate, toss, instil, impress, capture, convey, impart, circulate, transmission. passing, transportation, transport, transmission, shipment. defer, postpone, slow down, retard, decelerate. prevent, block, obstruct, disturb, handicap, delay, encumber. cease, hinder, halt, impede, keep, hold, stop, maintain. He had a man with him - forwarding agent, he called him. Thus disposed, these children of the forest passed hours in patient toil, in forwarding by means of a basket, the knots, and 'other combustibles, up to the warrior, who kept his position close under the building, and who piled them in the way most favourable to his object. progress, transmission, transmittal, transmitting, advancement.